Scholarships originate from a variety of sources. This page will help you understand who awards scholarships and why they support college education through this specialized funding. Colleges often have scholarship money available that is used to develop the financial package offered to an applicant who has been granted admission. These scholarships are available under a variety of terms that may include maintaining a certain GPA, pursuing a specific major or minor, etc. Many, many athletes dream of going to college on an athletic scholarship. It's possible to achieve that dream, but these scholarships are highly competitive and the application process is a world unto itself. Awards are made through colleges and applying for an athletic scholarship is similar to marketing yourself for a starring movie role. If you are interested in winning an athletic scholarship, go immediately to the National Collegiate Athletic Association (NCAA) website and begin reading as fast as you can. According to the NCAA, athletic scholarships for undergraduate student-athletes at Division I and Division II schools are partially funded through the NCAA membership revenue distribution. These scholarships are awarded directly by each academic institution and not the NCAA. About $1 billion in athletic scholarships are awarded each year. Over 126,000 student-athletes receive either a partial or full athletic scholarship. Division III schools offer only academic scholarships. They do not offer athletic scholarships. Second, contact the financial aid office of the school you hope to attend. They should have lots of information about available awards. Third, find and read detailed information about the process of winning athletic scholarships. You might start with the site,www.collegesportsscholarships.com, created by an athlete and his dad to help other athletes understand the scholarship process. It's all free and it looks like a good starting point. These merit-based scholarships are awarded by your college for academic achievement. Inquire about these awards at your school's financial aid office though you may not even have to apply for an academic award; they are often wrapped into the financial aid package offered by the college, based on your college application. Specific departments may have scholarships available to attract or retain student in the department's field of study. If you know what your major will be, contact that department to inquire about scholarships. There are thousands of private organizations that offer scholarship awards, ranging from $50 to $20,000 and more. Within the "private" category there are many types of organizations to consider. Corporations offer scholarships to attract and retain employees, support the communities where the business is located and encourage entrants into the business' field of work. These are often the scholarships that go unawarded for lack of applicants. Search for corporation scholarships by checking with your parents' employers for possible programs, researching businesses in your region and searching your newspaper's archives for award announcements. You may have a much greater chance of receiving a private corporation award because geographic, employment and other restrictions narrow the number of candidates. Religious organizations often award scholarships to help their members afford the cost of college. If you and your family are affiliated with a specific religious group, check with your local group about the availability of scholarships. Unions are a major source of scholarship funds. The AFL-CIO website offers a scholarship search service related to union-sponsored scholarships that includes $4,000,000 in available funds. 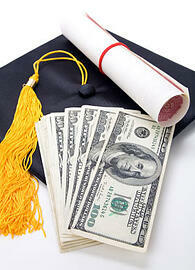 Your high school may offer scholarships to graduating students. Your high school guidance counselor can provide information about availability. Chambers often have scholarship programs and they can be great sources of information about which businesses in your community offer scholarships. The ubiquitous category "other" is really the mother lode of scholarship opportunities. There are thousand of scholarships available, given by organizations who wish to further their mission by supporting the education of students. This category of scholarships is the reason for using a web search engine to identify suitable opportunities in this vast universe of money offers. The military is a well-known source of college scholarships. The Air Force ROTC program can pay up to full college tuition plus a stipend for books. Military scholarships are awarded in return for a tour of duty with the branch of the military supporting your education. Be sure you're prepared to fulfill the terms of your scholarship agreement. If the prospect of military service fits with your goals, a military scholarship may be an excellent way for you to underwrite your college education. In order to receive a grant from the federal program, your college must qualify to administer these grants. Check with your school's financial aid department to be sure your school is a qualified participant. The internet site where you can fill out your "Free Application for Federal Student Aid", (FAFSA), http://www.fafsa.ed.gov, provides great information about federal grant programs. Check with your state's higher education authority to see what kind of assistance is available. Many states provide excellent scholarships and grants and often have special categories of award for women going back to school, minorities, and people with disabilities. Be sure to follow all application procedures and deadlines. Many colleges will not make up for state grants lost to students though late applications. Additionally, many states and private colleges administer need-based institutional funds which help round out financial aid awards. The categories described on this page represent thousands of scholarships and billions of dollars in financial aid. Your job is to make your way through the maze of information and options and in doing so, create a scholarship application plan that gives you the highest probability of success with the best scholarship matches available.